Now available in bundle with WiFi logger – exclusive to weatherstations.co.uk – please phone or email for details. This page is an outline introduction to the Vantage Pro 2 models. For more details please visit our main Vantage Pro 2 page. 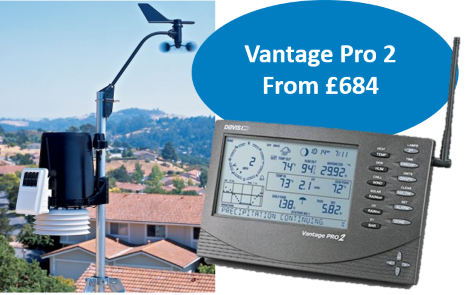 The Davis Vantage Pro 2 (VP2) stations are a family of weather stations designed to professional standards, but still relatively affordable. There are several different VP2 models, which are all based around a common design, but with numerous options available as to sensor and console configuration. The VP2 differs from the simpler Vue station in many aspects of design and specification, but the main distinction is that the VP2 models offer much more flexibility and expandability. Anyone looking for something more than a very basic weather station will almost certainly be able to find a suitable model in the VP2 range. VP2 stations (AS revision onwards) now include a high-accuracy (±0.3C) temperature/humidity sensor and (AZ revision onwards) the AeroCone rain gauge. WiFi logger at same price as USB. All Vantage Pro 2 stations consist of two main parts: the outside sensor assembly (see left-hand photo in the image above) and the display console (on the right). The sensor assembly (often called the ‘ISS’) obviously sits outside in the weather, while the console is usually placed indoors where its LCD display screen can easily be read to see the very latest weather readings. In the VP2 range, there is a choice of a cabled or a wireless connection between ISS and console. These are two different model ranges – you need to specify a cabled or a wireless model. (NB You cannot interconvert between cabled and wireless.) The wireless models have a range of up to about 250m clear line of sight, while 30m cable is supplied with the cabled versions (which can be extended up to 300m). Shown left is a close-up of the standard VP2 display console, as included with all complete VP2 stations. The VP2 display console is the unit that sits (usually) indoors to provide a comprehensive display of current weather conditions on its large LCD display. The upper part of the display always shows the same readings (wind speed, air temperature etc), while a range of different readings can be called up on the lower part by using presses on specific control buttons. A summary forecast for up to a few hours ahead can be shown on the bottom line of the display. Full details of the console display are described on the separate console display page. In addition to the standard console, there is also a range of compatible, but cheaper, Envoy consoles, which have similar functions to the standard unit but with no LCD display. These Envoy consoles are useful in specific applications and also as a second console where weather data needs to be fed only to a PC and not displayed locally. There are also a couple of special receiver units in the VP2 range: the Envoy8X console, which is an extra powerful Envoy version able to listen to many sensor transmitters at the same time and much greater memory; and the Connect unit, which is a totally self-contained solar-powered unit able to transmit data via the 3G phone network and therefore ideally suited to remote weather monitoring applications for farming etc. For full details of these consoles and also of the many supplementary sensors and other VP2 accessories please follow the links provided or read through our main VP2 pages. 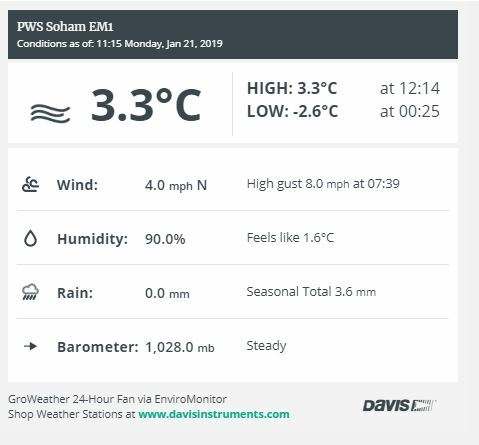 Many users like to link their weather station to a PC in order to keep detailed long-term weather records and also, perhaps, to run their own live weather-reporting website (see right). Both of these options are perfectly possible with a Vantage Pro 2 by fitting a Weatherlink data logger pack to the standard VP2 station – a straightforward and easy-to-use option. A wide range of data loggers is available for the Vantage Pro 2 stations, ranging from the popular 6510USB type through to the 6555 WeatherlinkIP logger (and the more advanced streaming loggers too). All data logger packs include a free copy of the Weatherlink for Windows (or Mac) software for data archiving and analysis and for running a weather-reporting website. A full range of compatible third-party software is also available via the Internet (some free, others at modest cost). 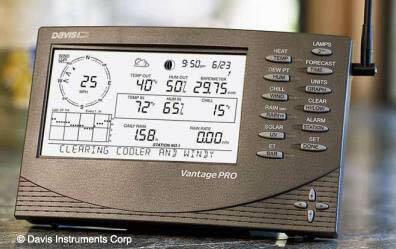 A first introduction to the capabilities available if you link a VP2 to a PC (or Mac) and, potentially, also to a website can be found on our introductory page to loggers, PCs and weather websites.